Bring the moon into your own room. The authentic moonscape shines moonlight just like the real moon. The remote controlled moon automatically scrolls through twelve illuminated lunar phases. Manual function allows you to set your own moon to look just like the moon outside. 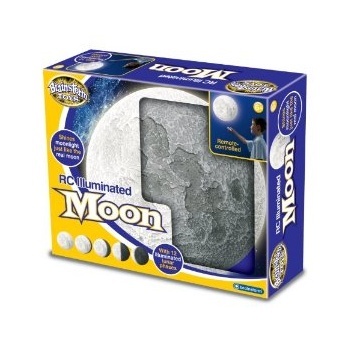 Detailed moon makes stunning room accessory or reassuring night light. Easy to hang on your wall - just like a picture. Auto shut-off saves battery life. Read fascinating information about the moon in the colourful educational booklet.